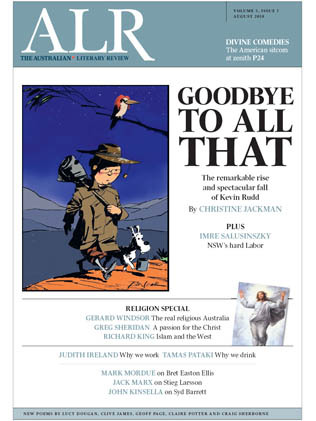 I’ve somewhat belatedly realised today is Australian Literary Review day. As usual selected highlights are available online, including the Pascal Award-winning Mark Mordue on Bret Easton Ellis’ Imperial Bedroom (which I’ve been meaning to try and compose some thoughts on myself) and a number of pieces linked to the election, of which the most significant is probably Christine Jackman’s piece on Annabel Crabb, David Marr and Nicholas Stuart’s books about Kevin Rudd. ALR Editor Stephen Romei’s Editorial is also online. Reading Stephen’s Editorial has also reminded me that next week is the Walkley Foundation’s Annual Conference, which this year is focussed on narrative. Given it’s smack in the middle of the penultimate week of the election campaign it’s possible it’s not the most perfectly timed media conference in history, but it’s still got a pretty fantastic line-up. Featured international speakers include author and academic, Jay Rosen (the man behind PressThink), political blogger, John Nichols, South African activist and academic Harry Dugmore and NBC News Correspondent Bob Dotson. There’s also a host of Australian speakers, including Charlotte Wood, Malcolm Knox, Kerry O’Brien, Laurie Oakes, Annabel Crabb and Lawrie Zion. I’m appearing on two panels on Wednesday 11 August, ‘Writing in the Internet Age’ at 11:40am with Jay Rosen, Crikey! Editor Sophie Black and Meanjin Editor and author, Sophie Cunningham, and ‘The Critics Speak’ at 3:30pm with Jenny Tabakoff, Stephen Romei and Sydney Morning Herald Literary Editor, Susan Wyndham. It looks like a fantastic program, so with luck I’ll see at least some of you there. More information is available on the Walkley Conference website.